The original 5 1/2 acres on which the first church building (now the main school entrance) was located were purchased from Willard and Lucina Carpenter for $110 by Fred Kercher, Anton Behme and John Bumb and donated to the Bishop of Vincennes, Bishop St. Palais, for the purpose of erecting a parish church and school. The deed was recorded on December 10, 1853. A combination one-room school and chapel (a log and frame structure) were immediately erected on limestone blocks. One year later, a house for the school teacher was built adjoining this structure. The mission was known as St. Margaret. Services were conducted in the chapel once a month. ​The school was abandoned in the early 1880's and the house and ground rented out. Another attempt was made to reorganize the school in 1898, but :he attempt failed. The ground became known as the "Bishop's Ground." Shortly after the abandonment of the school, the house was destroyed by fire. The property was again rented, but after 1920, the property became idle. On August 7,1954, the Most Reverend Henry J. Grimmelsman, Bishop of the Diocese of Evansville, Indiana, designated this property as a newly created parish: the Church of the Resurrection. Reverend Roman F. Vollmer was assigned as the first pastor of the newly-created parish. On April 28, 1955, an additional 6 1/2 acres were purchased from Louis Happe. On November 22,1954, the cornerstone was laid for the new church. On January 10,1957, the first kindergarten class was held in the rectory basement. 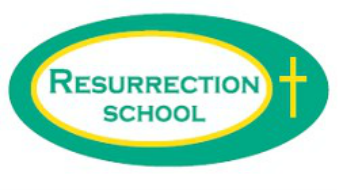 Resurrection School opened its doors in the 1963-64 school year. The Sisters of St. Benedict who taught here lived in some of the present-day classrooms. On November 1, 1981, the present church was dedicated and the old church was converted into a gym. In 1987, four new rooms were added to the school to accommodate continued growth. In July, 1996 the old church/gym building was razed to make room for school expansion. On August 9, 1997 another new addition to the school was dedicated including new administrative offices, 7 new classrooms, preschool area, and a new gymnasium. Currently, the school has approximately 342 students in grades K-8 and 50 students enrolled in the preschool program. In 1999, 2.75 acres were purchased for future growth and expansion. In 2008 we began a 3 year Renovation Fund Drive for some major improvements to the church and property. We have paid off the remaining debt of $133,000.00, expanded our upper parking lot including major improvements and replaced the Church & Rectory Roofs to date. The parish community continues to grow. One of its notable characteristics is the spirit of working together. We continue to try to live our mission statement. On August 7, 2004, Bishop Gerald Gettelfinger celebrated a Mass of Thanksgiving to mark our 50th Anniversary of Resurrection Parish. In 2014, the Padre Phil Parochial Parkway was completed, connecting the upper parking lot and the lower parking lot around the back of the school. In 2016, the science room was updated with new lab tables and equipment. As well, 2016 marked the institution of the Resurrection Houses, an opportunity for students across grade levels to grow, learn and lead.